Filipino boxer and newly elected senator Manny Pacquiao is planning to return to the ring, according to his long-time promoter Bob Arum. The 37-year-old, elected to the senate in May, had said in April he was retiring after beating Timothy Bradley. Mr Arum said Mr Pacquiao was now eyeing a return around November, against an unnamed opponent. 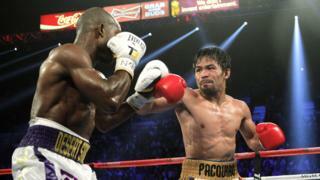 But in a statement, Mr Pacquiao said no fight had been discussed and he would not be taking a break from politics. "My priority is my legislative works," he said on Facebook. "If I ever decide to fight again, rest assured, it will happen when Congress is on recess so there's no need for me to go on leave." Mr Pacquiao, previously a congressman, said boxing was his "only means of livelihood" to support his family and people in need. Mr Arum told reporters that Mr Pacquiao "likes to fight and he likes the attention". He said the head of the senate had given the senator permission to train once the country's budget is settled in mid-October. "He now has given us the go-ahead to shop for a venue and an opponent and see if we can do it on a particular date or dates," Mr Arum told the Guardian newspaper.